Calibrated Balancing Valve - Multi-turn, variable orifice adjustment. Provides two position hydronic circuit isolation capability and multi-turn throttling adjustment as required for proportional balancing of hydronic systems. 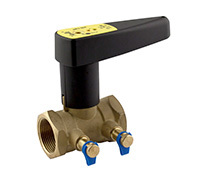 The valve's unique needle valve adjustment, with integrated digital readout incorporated into the handle, allows qualified technicians to have the valve function as a highly accurate variable orifice flow meter. When the remaining stock is depleted, this valve will be discontinued. Call M&M for assistance at 800-876-0036.